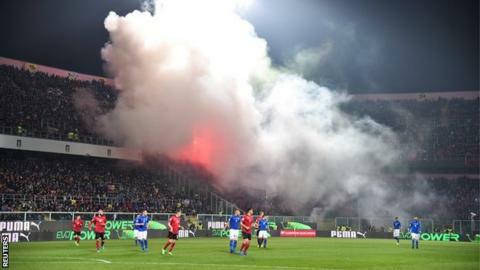 Italy's 2-0 win over Albania was held up for eight minutes after visiting fans repeatedly threw flares and smoke bombs on to the pitch. Italy - in goalkeeper Gianluigi Buffon's 1,000th career game - were leading through Daniele de Rossi's penalty when referee Slavko Vincic took the players off the pitch. Albania's Italian manager Gianni de Biasi said: "I was really upset with the throwing of the fireworks. "I never thought I'd see that." Flares were first thrown on to the pitch as De Rossi waited to take a penalty but it was in the second half when the players were forced from the field. An announcement was made at Palermo's Renzo Barbera stadium warning fans their team could face sanctions if they continued and it had to be repeated, but that only sparked the lighting of more flares. Thirty-nine-year-old Buffon - who played in his 168th Italy game, making him the most capped European player - had to leave his goalmouth. One firework exploded near to a steward and he was taken away for assessment, though he was not injured. Albania captain Ansi Agolli appealed to the fans before play resumed. "I saw a different side to the Albanian fans, something I hadn't seen in my years here," said De Biasi. "I was struck and pained to see those scenes." The second goal came when Lazio striker Ciro Immobile headed home to leave Italy second in Group G - behind Spain only on goal difference. Manchester City midfielder David Silva and Chelsea striker Diego Costa both scored as Spain beat Isreal 4-1 in Gijon. Swansea playmaker Gylfi Sigurdsson also scored as Iceland beat Kosovo. Match ends, Italy 2, Albania 0. Second Half ends, Italy 2, Albania 0. Attempt missed. Armando Sadiku (Albania) right footed shot from the left side of the box is close, but misses to the right. Assisted by Burim Kukeli. Attempt missed. Sokol Cikalleshi (Albania) header from the centre of the box misses to the right. Assisted by Eros Grezda with a cross. Attempt missed. Daniele De Rossi (Italy) header from very close range misses to the right. Assisted by Lorenzo Insigne with a cross following a corner. Substitution, Albania. Liridon Latifi replaces Migjen Basha. Corner, Italy. Conceded by Burim Kukeli. Attempt blocked. Lorenzo Insigne (Italy) right footed shot from outside the box is blocked. Assisted by Ciro Immobile. Attempt missed. Burim Kukeli (Albania) left footed shot from outside the box misses to the right following a set piece situation. Foul by Andrea Belotti (Italy). Ledian Memushaj (Albania) wins a free kick on the right wing. Attempt missed. Migjen Basha (Albania) left footed shot from outside the box misses to the left following a corner. Corner, Albania. Conceded by Leonardo Bonucci. Attempt blocked. Armando Sadiku (Albania) right footed shot from outside the box is blocked. Assisted by Ledian Memushaj. Eros Grezda (Albania) wins a free kick in the defensive half. Offside, Italy. Lorenzo Insigne tries a through ball, but Mattia De Sciglio is caught offside. Substitution, Albania. Eros Grezda replaces Odise Roshi. Burim Kukeli (Albania) is shown the yellow card for a bad foul. Andrea Belotti (Italy) wins a free kick in the attacking half. Foul by Burim Kukeli (Albania). Corner, Italy. Conceded by Frederic Veseli. Delay in match Mattia De Sciglio (Italy) because of an injury. Odise Roshi (Albania) is shown the yellow card. Mattia De Sciglio (Italy) wins a free kick in the defensive half. Foul by Odise Roshi (Albania). Frederic Veseli (Albania) wins a free kick in the defensive half. Attempt blocked. Ledian Memushaj (Albania) right footed shot from outside the box is blocked. Assisted by Armando Sadiku. Goal! Italy 2, Albania 0. Ciro Immobile (Italy) header from the left side of the six yard box to the bottom right corner. Assisted by Davide Zappacosta with a cross following a set piece situation. Attempt blocked. Lorenzo Insigne (Italy) right footed shot from outside the box is blocked. Frederic Veseli (Albania) is shown the yellow card for a bad foul. Marco Verratti (Italy) wins a free kick in the attacking half. Marco Verratti (Italy) wins a free kick in the defensive half. Foul by Armando Sadiku (Albania). Attempt missed. Davide Zappacosta (Italy) right footed shot from the centre of the box is too high. Substitution, Albania. Armando Sadiku replaces Andi Lila.